With this personality profile I would like to draw your attention to a colleague who has an international professional biography. The person I would like to introduce is Farhad Rachidi. In the EMC Society, Farhad is well known for his research work on lightning discharge and its electromagnetic effects. In addition to his research activities, he is active in several societies, conference committees and technical committees. Personally, I have met Farhad several times at conferences. In 2008, I had the honor to serve under his leadership on the EUROEM 2008 committee. As I thought about the profile for the current issue of the EMC Newsletter, I thought it was time to write something on Farhad Rachidi. Consequently, I wrote an email, asking for some background information. I expected a personal flavor, but Farhad’s response surprised me. 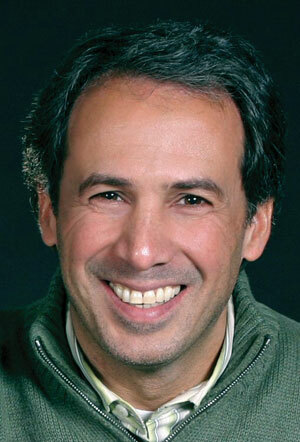 Farhad Rachidi was born in 1962 in Geneva where both his parents were studying. At the age of three months his family went back to Tehran where he grew up. He was raised in a family of artists. His father is a well-known and respected actor and director of theater and cinema. Farhad’s father is still active and one of his last plays he directed was Richard III by Shakespeare. Farhad has also two aunts in the movie business (one is a director and the other is an actress) and his little sister is also a theater actress in Tehran. After Farhad got his high school diploma from the French School, he intended to stay in the family business and study art. But his life turned to another direction. Due to the Iran revolution, the universities were closed down and Farhad Rachidi had either the choice of going to military service or studying abroad. The Iran government restricted studying abroad to studies in engineering and medical sciences. Farhad made his choice and started studying electrical engineering at the Swiss Federal Institute of Technology (EPFL) in Lausanne. Since then, his life has followed the typical path of an electrical engineer. He received the M.S. degree in electrical engineering and the Ph.D. degree from the Swiss Federal Institute of Technology (EPFL), Lausanne, in 1986 and 1991, respectively. From 1991 to 1996, he stayed with the EPFL at the Power Systems Laboratory and had several short stays at the University of Florida and the NASA Kennedy Space Center. In 1997, he left Switzerland and joined the Lightning Research Laboratory of the University of Toronto in Canada. From April 1998 until September 1999, he was with Montena EMC in Switzerland. Finally, he returned to the Swiss Federal Institute of Technology (EPFL) and became a professor. Currently, he is the head of the EMC Group at EPFL. His re­­search interests concern electromagnetic compatibility, lightning electromagnetics and electromagnetic field interactions with transmission lines. Farhad Rachidi is actively involved in the organization of various International Symposia in the field of Electromagnetic Compatibility and Lightning as a member of the Scientific Committees as well as Organization Committees. For instance, in 2008 he served as Chairman of the 2008 European Electromagnetics International Symposium (EUROEM 2008), Lausanne, Switzerland. Since June 2008, he has served as the President of the International Conference on Lightning Protection (ICLP). He is also active in research groups and scientific communities. He is a Fellow member of the IEEE and a member of various IEEE, CIGRE and CIRED working groups dealing with lightning. Currently, he is the convener of the joint CIGRE-CIRED Working Group “Protection of MV and LV Networks against Lightning” as well as the chairman of the IEEE EMC Society Technical Committee TC5 on lightning. Farhad was the Vice-Chair of the European COST Action P18 “The Physics of Lightning Flash and its Effects” (2005–2009), Associate Editor of the IEEE Transactions on Electromagnetic Compatibility, Deputy Editor-in-Chief of the Journal of Lightning Research, Co-Editor of the Open Atmospheric Science Journal, member of the Editorial Board of Book Series on Advances in Electrical and Electronic Engineering, Wessex Institute of Technology (WIT) Press, member of the Editorial Board of Book Series on Lightning and its Effects, Elsevier Press, and member of the Electromagnetics Academy. He is the author or coauthor of over 300 scientific papers published in reviewed journals and presented at international conferences. He was also the guest co-editor of the IEEE Transactions on Electromagnetic Compatibility (2009) special issue on lightning, of the Journal of Electrostatics (2004 and 2006), and special reporter for CIGRE (2004). Due to his research achievements and scientific activities, Farhad Rachidi has been the recipient of several awards. For example, in 2005 the IEEE EMC Society presented him with the Technical Achievement Award for outstanding contributions to the understanding of lightning discharge and its electromagnetic effects. He was also awarded the 2005 Technical Committee Award of the CIGRE (International Council on Large Electric Systems). In 2006, the Summa Foundation elected him as EMP Fellow and the French Association of Electrical Engineering, Electronics, Information Technology and Communication (SEE) awarded Farhad with the 2006 Blondel Medal. cocktail party. 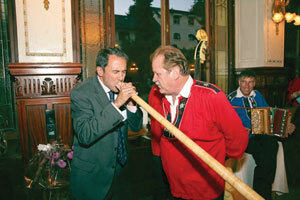 Farhad blowing an alp horn at the banquet of the EUROEM 2008 conference. On the personal side, Farhad has been married for over 20 years. 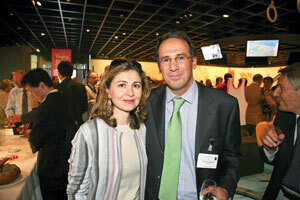 Farhad and his wife met in Lausanne when they were both students. His wife studied French literature and linguistics.